The 2018 PyeongChang Paralympic Winter Games will close Sunday after a record-setting run over 10 days. Following the Feb. 9-25 Olympic Games, the 12th Winter Paralympic Games opened March 9 in PyeongChang, some 180 kilometers east of Seoul, along with the sub-host cities of Gangneung and Jeongseon. They hosted 567 athletes from 49 countries -- both records for Winter Paralympics. The athletes vied for 80 gold medals, also a record for the multi-winter sport event for the disabled. The United States topped the Winter Paralympic Games for the first time since Albertville 1992, taking 13 gold, 15 silver and eight bronze medals. The Neutral Paralympic Athletes from Russia was second, with eight gold, 10 silver and six bronze medals. The Russians were not allowed to compete under their national flag due to a state-sponsored doping scandal. Canada finished third, with nine gold, four silver and 16 bronze medals. Of the 49 competing delegations, 26 have won a medal, beating the record set at the Lillehammer 1994 Paralympic Winter Games. A record 20 countries have won gold, beating the previous best of 17 set at the Nagano 1998 and Salt Lake City 2002 Paralympic Winter Games, according to the International Paralympic Committee (IPC). China, Croatia, Kazakhstan and host South Korea all earned their first Winter Games gold medals in PyeongChang. The PyeongChang Paralympics were the most successful Winter Paralympics in terms of ticket sales. The local organizers said more than 343,000 tickets were sold, which easily passed Sochi 2014's 316,200 tickets. They're also more than double the 162,974 tickets sold at the Torino Paralympics in 2006. The local organizing committee expects at least 6.6 billion won (US$6.1 million) in revenue from the ticket sales. For its first Winter Paralympics at home, South Korea sent its largest 83-member delegation, which included 36 athletes across all six sports. And history was made for the country when para Nordic skier Sin Eui-hyun won South Korea's first Winter Paralympics gold by topping the men's 7.5-kilometer sitting cross-country skiing. 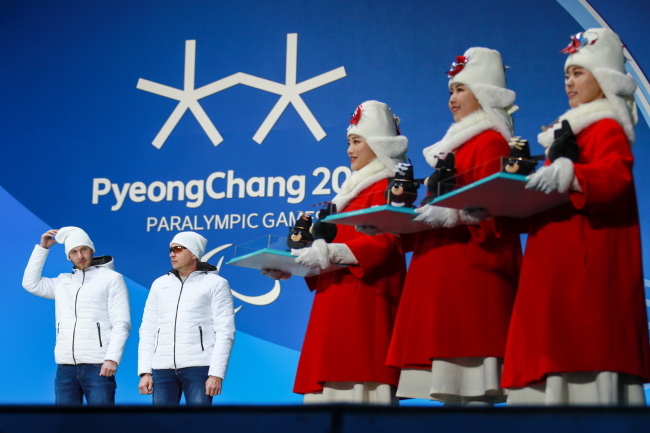 Prior to PyeongChang 2018, South Korea only had two silvers in the past seven Winter Paralympics. As a result, South Korea posted its best Winter Paralympics performance ever. The country won one gold and two bronze medals to share 16th place with Finland and New Zealand in the medal standings. The two bronze medals came from the men's ice sledge hockey team and Sin, who finished third in the men's 15km sitting cross-country skiing. The PyeongChang Paralympics had three Winter Paralympics debutants -- North Korea, Georgia and Tajikistan. North Korea sent six athletes, but only two cross-country skiers -- Ma Yu-chol and Kim Jong-hyon -- were able to compete after they were granted special entries by the IPC. The other four came here as observers. Unlike the Olympics, the two Koreas didn't have a joint march at the opening ceremony, but they showed a moment of harmony when the North's Ma and South's Choi Bo-gue carried the Paralympic torch together before the cauldron lighting. North Koreans returned home Thursday, so there will be no Korean collaboration at the closing ceremony, which is scheduled for 8 p.m. Sunday at PyeongChang Olympic Stadium. However, the closing ceremony will still deliver a message of hope and dreams of athletes with disabilities. Titled "We move the world," the closing ceremony will include three big cultural performances that will emphasize the passion of the Paralympians and the Paralympic values. Executive Creative Director Lee Moon-tae and his unit had only one-tenth of the Olympic ceremonies' budget but already presented a heartwarming show with a message of coexistence at the opening ceremony. There will be also an art performance from Beijing, which will host the next Winter Paralympic Games in 2022. During the closing ceremony, the world will also see South Korean Dr. Whang Youn-dai presenting the top Paralympian award to New Zealander para alpine skier Adam Hall and Finnish para Nordic skier Sini Pyy. The Whang Youn Dai Achievement Award was established by IPC at the 1988 Seoul Summer Paralympics and has been given to two athletes at the end of each Paralympic Games. It is presented to Paralympians who best exemplify the spirit of the Games and the Paralympic values. Throughout the Paralympics, the local organizers focused on accessibility, trying to provide a comfortable environment for people with disabilities. They operated 48 buses that can transport people in wheelchairs and 185 wheelchair-accessible cars. For the venues that had slopes, they also used golf carts and wheelchair lifts to facilitate spectator's mobility. A sign language interpreter service and Braille brochures were considered useful throughout the Games.